Chris Roberts’ Cloud Imperium Games last month asked the Star Citizen community whether they still wanted stretch goals to fuel the game’s ongoing crowdfunding campaign. They voted yes, and so the neverending telethon continues. The increasingly absurd total has now topped $48 million, and funded a sleek new video advertisement for one of the game’s bombers. As well as the PC space game and international games studio, obvs. 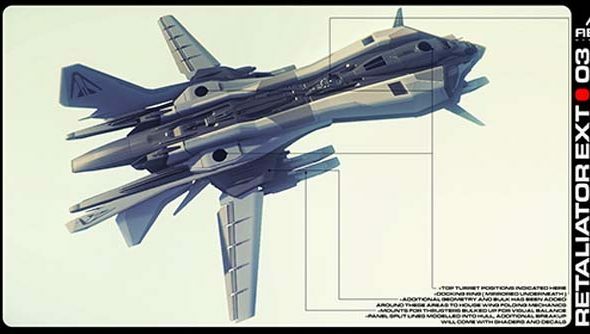 The Retaliator is a jump-capable heavy bomber that doubles as the “symbol of the United Empire of Earth’s power”. Its plane-like silhouette is interrupted by jutting turrets, which do a whole lot more than just symbolise power. Players can fly versions of the Retaliator adapted to carry cargo rather than antimatter bombs. They’ll make for strong medium freighters or basic explorers. The ship will now be the subject of a slick faux-commercial, courtesy of Cloud Imperium. Should Star Citizen meet the $49m crowdfunding mark, players will be rewarded with a space plant, “similar to a bonsai tree”. Hrrm. In November, Chris Roberts said he expected Star Citizen would eventually outfund “most AAA console games”, excluding the likes of GTA and CoD. Are you still funding Star Citizen? Or was once enough?